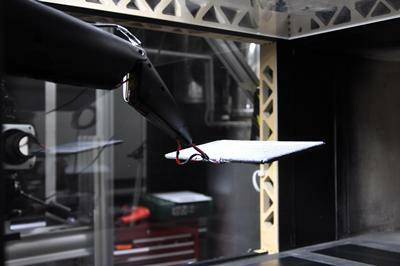 Researchers from the University of Southampton have designed innovative membrane wings inspired by bats, paving the way for a new breed of unmanned Micro Air Vehicles (MAVs) that have improved aerodynamic properties, can fly over long distances and are more economical to run. The wings work like artificial muscles, changing shape in response to the forces they experience and have no mechanical parts, making MAVs incorporating them easier to maintain. The unique design of the wings incorporates electro-active polymers that makes the wings stiffen and relax in response to an applied voltage and further enhances their performance. By changing the voltage input, the shape of the electroactive membrane and therefore aerodynamic characteristics can be altered during flight. The proof of concept wing will eventually enable flight over much longer distances than currently possible. The wings have been developed and successfully tested in-flight through a unique combination of hands-on experimental work at the University of Southampton and computational research at Imperial College London, with funding from the Engineering and Physical Sciences Research Council (EPSRC). The United States Air Force, through their European Office of Aerospace Research and Development (EOARD), provided additional support. Sometimes as small as 15cm across, MAVs are increasingly used in a wide variety of civil and military applications, such as surveying remote and dangerous areas. One emerging trend among MAV developers is to draw inspiration from the natural world to design vehicles that can achieve better flight performance and that offer similar levels of controllability to small drones but use the efficiency provided by wings to fly much further. The Southampton-Imperial team have focused on mimicking the physiology of bats – the only type of mammal naturally capable of genuine flight. To inform and speed up the design process, the Imperial team built innovative computational models and used them to aid the construction of a test MAV incorporating the pioneering ‘bat wings’. 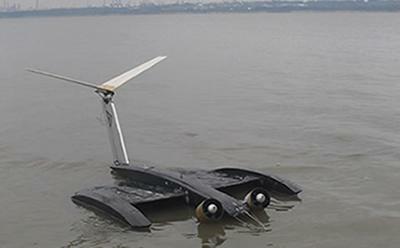 The Southampton team incorporated some of these findings into a 0.5m-wide test vehicle, designed to skim over the sea’s surface and, if necessary, land there safely. After extensive wind tunnel testing, the vehicle was put through its paces at a nearby coastal location. The next step is to incorporate the active wings into typical MAV designs, with deployment in real-world applications potentially achievable over the next five years. “This is a paradigm shift in the approach to MAV design. Instead of a traditional approach of scaling down existing aircraft design methods, we constantly change the membrane shape under varying wind conditions to optimise its aerodynamic performance,” said Dr Rafael Palacios of Imperial’s Department of Aeronautics, who led Imperial’s aspect of the project.